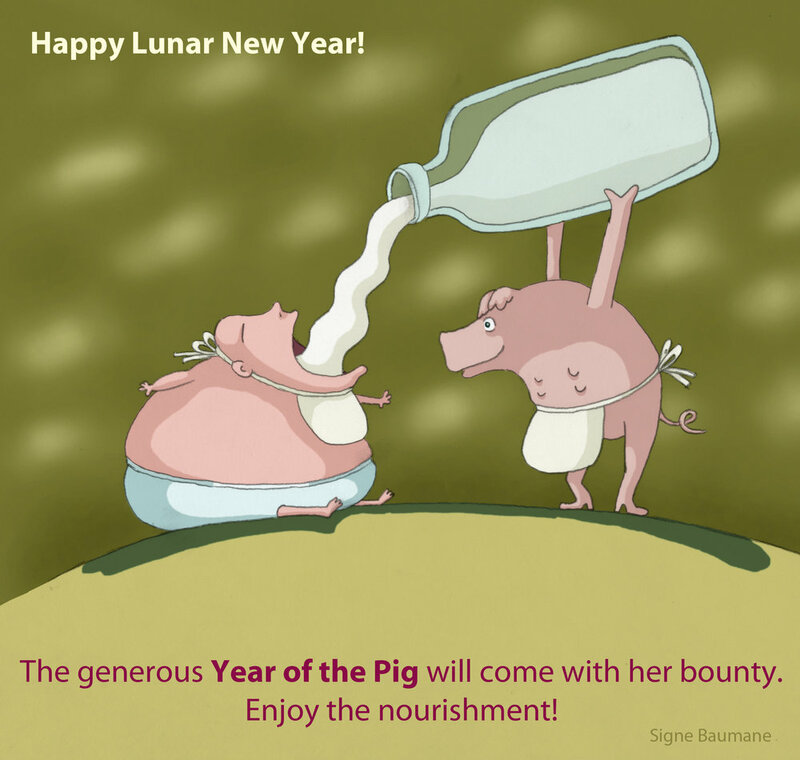 The Year of the Pig promises to bring luck, fortune and pleasure if you stay in charge of your own urges. We all need a little bit of money and good luck to achieve what we set out to do. 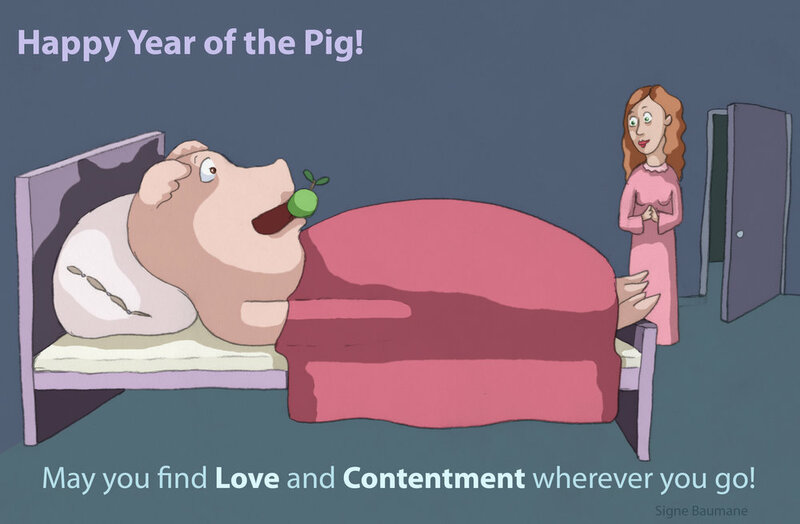 Especially a woman who is in the middle of a production of an animated feature project, animating 29 speaking and over 200 non-speaking characters, a project surely testing her abilities and limits, could use a little lift from the Year of the Pig. Overworked and stressed out she would love some relief from of that strain. So, lets celebrate all of our hopes for 2019! You can download the cards and share them with your friends. 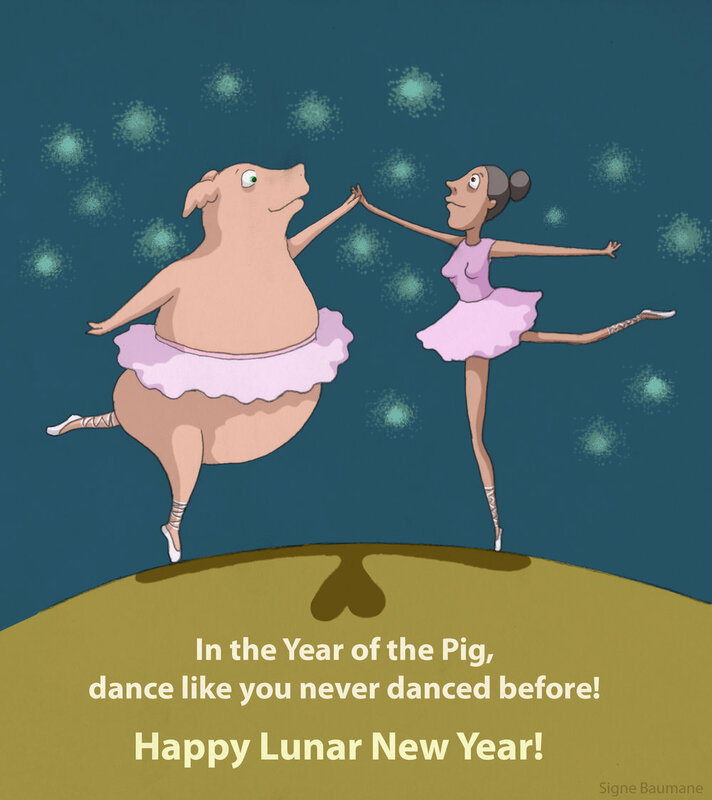 If you would like to support my animated feature film “My Love Affair With Marriage” and feed an artist in the Year of the Pig, you can do it HERE. Every little bit helps to move the project towards the finish line.. I am grateful for your LOVE and SUPPORT! It is clear now - the 2017 was like a drunk gift-delivery driver. You watched it with hope and anxiety: will it run me over? will it remember to give me gifts? Running away from being hit while trying to get closer to the gifts was quite a task. But we managed it, somehow. Now we wake up in the middle of night with a new anxiety. It has become obvious that 2018 is not going to be the same as 2017. The needles have moved, the accustomed points of references discarded. New piñatas are craving the abuse. Will I avoid suffering? Will I succeed to eat, work and be merry? I have met people who follow astrological instructions to the letter, and met people who dismiss astrology as a hoax. Personally, I like astrology and horoscopes. They make me think where I am in my life at the moment and help to define what I want from the future. Opportunism, I thought, is my second skin. I love opportunities. And I started a new project, as advised. But before long, in March, my landlords informed that they are not extending my lease. I was too small a fish for their liking. - Move out so we can make more money! - they said. After a frantic 7 week search we found a space that suited the needs of my operation of building and filming sets. But it was more expensive and needed some serious work before moving the studio in. To save money, we laid the floors and build the walls ourselves nearly breaking our backs, and in June moved the studio. In August the elections started shaping up and to help my candidate who was running against a person with a short attention span, I went every weekend to Pennsylvania to canvass for her. It is not possible for her to lose, I thought. She is too good and her opponent is too loose. But to a great shock of at least 66 million people who rooted for her, she lost. - What is this? - I demanded to know from the Astrology books. - What kind of Monkey is this? - I yelled. Then I saw in the small print under the predictions: due to Monkey's short attention span, the year will be full of unexpected turns and twists. Things could turn on a dime. Opportunities, I realized, in 2016 were for the monkeys sitting on higher branches. My brand of opportunism didn't get to score in a year of this Monkey. So I turned my hopeful eyes to the next year - which is starting today- to the year of the Rooster. What does it promise and what is in the small print that I should know about? The Rooster loves intense drama, the horoscope says. Organize and persist. The year will reward commitment and hard work. - Oh well, - I said. - That means I have to start a Kickstarter campaign. Because I can't imagine harder and more intense work than running a Kickstarter campaign. And I started a Kickstarter campaign for my new animated feature film "My Love Affair With Marriage". Because, you know, peck by peck I can collect a few thousand grains. I organize, I commit, I persist and work hard. What can go wrong? When a Rooster sings in the darkest hour of a night all unfriendly fiends scatter. Lets sing together to clear the way for the New Year! Happy 2017!